The last two weeks have been a little light on reading for me. 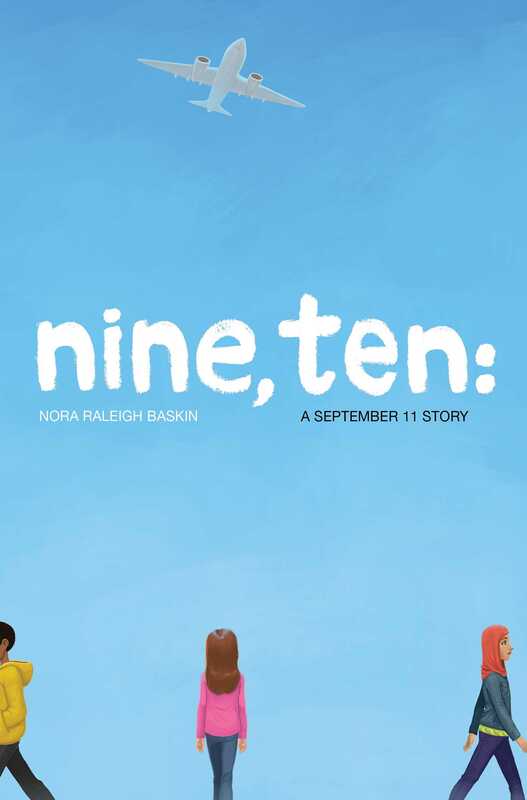 I did manage to get in one chapter book, which was Nine, Ten: A September 11 Story by Nora Raleigh Baskin. I had put off reading this one for a little bit even though I have read nothing but positive reviews about it. Once I started I found myself reflecting back on that day, but I was also eagerly anticipating how the author would bring the book to a close in a way that would bring positive light to a very painful event in our history. As others have commented, there is inspiration at the end of the book. I loved the message about unity at the end and what it shows about how we can face tragedy. I liked how the author intersected the lives of the four characters, from whose perspective the book was told, both at the beginning and the end of the book. 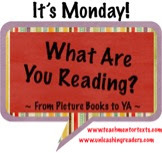 In addition to this book, I read a couple of picture books that I just adored. This picture book is beautiful and inspirational. The story is based on the childhood of astronaut Chris Hadfield. In the book, Chris spends a lot of time pretending to be an astronaut. Chris is pictured playing alongside his dog, who is sometimes the alien and at other times a co-pilot. When it is time to go to bed, Chris would rather continue to play because he has important work to do as an “astronaut," but also because he is afraid of the dark. Terry and Eric Fan bring a child’s imagination to life with their illustrations of the dark in which shadows appear to be aliens. Chris overcomes his fear after watching the landing of Apollo 11 on a neighbor’s television. He realizes that the universe is so much darker than his room and that he’s not alone in the dark because he has his dreams. The end pages of the book tell about Chris Hadfield’s life and how his dream of being an astronaut came true. In a wonderful message from Chris at the end of the book he writes, “ The dark is for dreams – and the morning is for making them come true.” This is a wonderful picture book to show readers the possibility of overcoming fears and dreaming big. Mo Willems has never written a book that I did not love. Nanette is a frog with a big responsibility because today is the day she must get the baguette. She exclaims, “You bet!” and an excited and confident frog is on her way to complete the errand. Unfortunately, Nanette’s lack of self-control gets the better of her and she eats the baguette before it ever gets home. Nanette is full of worry about what her mom will think – she frets, she sweats, she even thinks about moving to Tibet. Mom gives Nanette a surprise that turns her day around. There is much to love about this book. 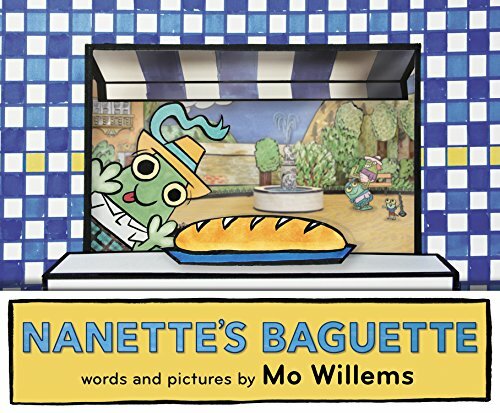 The silly rhymes – who know there were so many words that rhymed with baguette – bring humor to the plot. The illustrations are wonderful as well, containing details that add to the humor. In spite of all the silly humor, Nanette is charming and the story is an endearing one about forgiveness and mistakes. I enjoyed the first two books you shared, think the 9-11 books that have come out have handled that terrible day with thoughtfulness and hope, as you wrote, Lisa. I just read The Darkest Dark, and it is good! Still need to find the new Mo Willems, can't do without him! I have to read the other 9/11 books. Maybe Towers Falling will be next. Mo Willems is a genius! Unfortunately, Nanette’s Baguette is not yet available from my library. Being retired has it's drawbacks. How I miss those days when I used to just order new books for our school library. The Darkest Dark is on order and I have a put a hold on it. Sometimes it takes so long for the local library to get new books! Sometimes I give up waiting and just buy the book myself! Your cover for The Darkest Dark is different from the one I've seen, that's interesting! I believe the author is Canadian, I wonder if there are 2 different covers depending on where you live? I really enjoyed Nine, Ten. Our 4th graders listened to it as their first read aloud. Lots to do with tracking characters in that one. We skyped with Nora and she was amazing to listen to and chat with. I was just thinking the same thing! The copy we have here in Canada is different - it's much darker, and less cute! My book doesn't have that cover either. I accidentally posted the wrong image. How great, Michelle, that your students had the opportunity to skype with Nora. I have to check out her other books. Good point about having a Canadian icon other than pop singers!